Two weeks ago, the restaurant formerly known as Benton’s Steak & Chop House held an event to reintroduce itself as Benton’s Prime Steakhouse. Your Lunch Bloggers were excited when we got an invitation -- and if you’ve read the blog before, you can understand why we were a little perplexed, too. Either way, we weren’t going to pass up the opportunity to check out Benton’s menu. 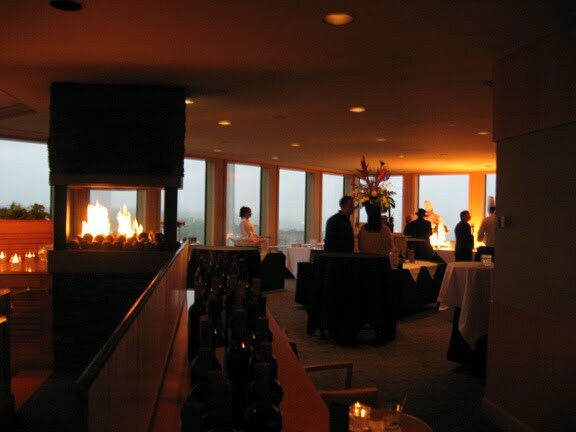 Robert: Located on the 20th floor of the Westin Crown Center, the bar at Benton’s has a great view of downtown Kansas City. Kelly and I arrived a couple of minutes before Shaw, and I got a glass of wine while we waited. 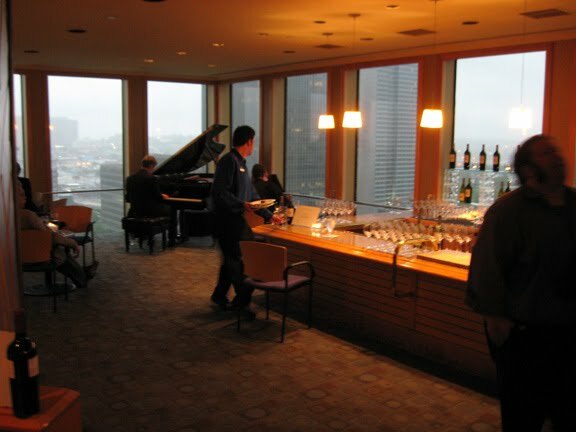 Shaw: I’d actually been to Benton’s a few times before, but only on Thursdays for $5 martinis. After all, while we here at Lunch Blog enjoy classy drinks, we also pride ourselves on maintaining a thrifty, Depression-era financial outlook. Robert: Kelly and I had already done some recon on the starters, and as soon as Shaw arrived, we got in line for the Lobster Bisque ($12). Normally flambéed tableside but tonight prepared at a non-roving flambé station, the bisque was creamy and delicious. Shaw: Good salads, as well. There was a Caesar Salad ($9), Tomatoes & Fresh Mozzarella ($10), and, my favorite, the Spinach Salad ($9). With strawberries and a warm bacon dressing, the salad was contained within a fried cheese cup. I don’t know if the salad usually comes in a regular bowl, but I do know this -- ceramic dinnerware isn’t nearly as tasty as fried cheese. Robert: We also had a bite of “Show-Me-State” Caviar ($49/1.5 oz., $99/4 oz. 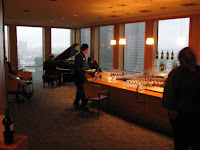 ), which we are in no way qualified to pass any kind of judgment on, having never actually been in the same room as caviar before, much less tasted it. 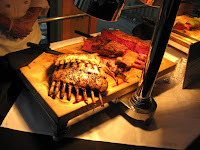 Shaw: But it was the fine array of meats we were looking most forward to. Benton’s did not disappoint, offering samples of many different entrees, including a few that aren’t on the regular menu. 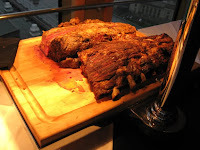 There was a buttery-soft Prime Rib ($34/12 oz., $42/16 oz. 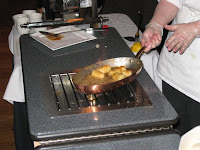 ), which was accompanied by a demi-glace au jus that added the right amount of saltiness. Also fantastic was the Garlic & Mint Marinated Lamb Rack -- the guy carving it recommended a drizzle of béarnaise sauce, but I liked the lamb even more without it. 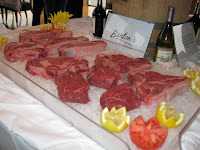 Robert: I couldn’t get enough of the Grass-Fed Bison Striploin ($36/12 oz. ), so smoky and flavorful -- I was told while the bison had been smoked for tonight, it usually is not. I would’ve gone back over and over for more, but I started to feel like I was pushing my luck on my second return visit and was afraid of getting the stinkeye. I hereby propose we create the Lunch Blog Super-Sneaky “Mr. Debonair” Instant Disguise & Moustache Kit for the next time we encounter this scenario. 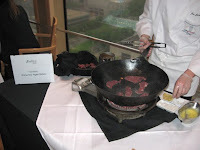 Shaw: Flambéed Sirloin was being prepared at another station. Thinly sliced and tender, I really liked the savory brown sauce and mushrooms the sirloin was topped with. Finally, I think the only reason the Herb-Crusted Angus Tenderloin didn’t stand out all that much to me was because all the other meats were so awesome. Robert: Over at the sides, Kelly really liked the Herb Crusted Yam & Potato Pave with Onion Soubise ($9). I had a couple of bites and thought it was pretty good. Would’ve had more if I hadn’t been preoccupied with scheming up ways to score more bison. Shaw: For dessert, I can’t say enough good things about the Bananas Foster ($19) -- bananas sautéed with butter and brown sugar, flambéed with rum and banana liquor, and served over vanilla ice cream. Robert: This is the perhaps the only circumstance under which I think I would ever want to partake of banana liquor. 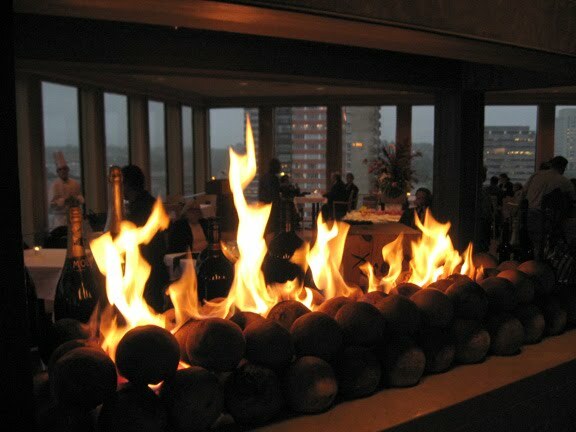 Shaw: What with the Lobster Bisque, Flambéed Sirloin and Bananas Foster, they sure do love to flambé stuff at Benton’s. Robert: That dramatic, potentially dangerous presentation doesn’t come as too much of a surprise to me, since the kitchen is led by Chef Quentin Tarantino. Shaw: I believe his name is actually Martin Heuser. Robert: Are you sure? He looks an awful lot like Quentin Tarantino. 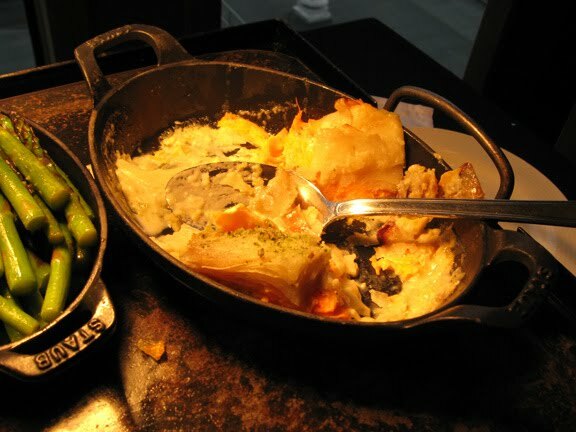 Shaw: As we were eating, General Manager Brent Grider explained the reason the restaurant’s name is being changed to Benton’s Prime Steakhouse -- Benton’s now features only beef certified as prime, representing the top 2 percent of all beef available. 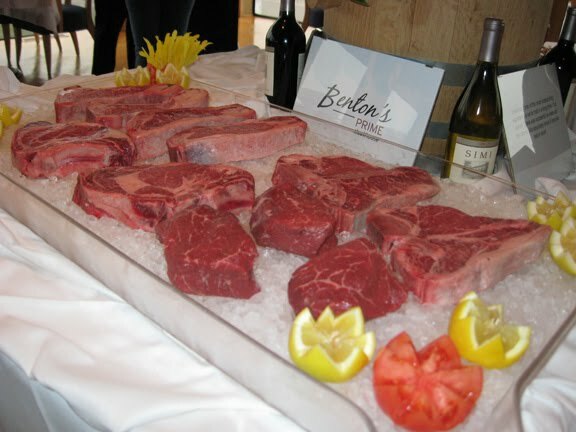 Benton’s also dry ages their steaks for at least 21 days. Grider went on to say that during the month of June, Benton’s will be donating 10 percent of its revenue to the United Way. Robert: While we’d love to go back and eat for a good cause, here at Lunch Blog our pockets only run so deep. Still, we can appreciate what Benton’s is doing, and in that spirit during the month of June we will pledge 10 percent of all our fast food purchases to the United Way. Shaw: Hey, that’s 8.9 cents per Beefy 5-Layer Burrito. Not too shabby. 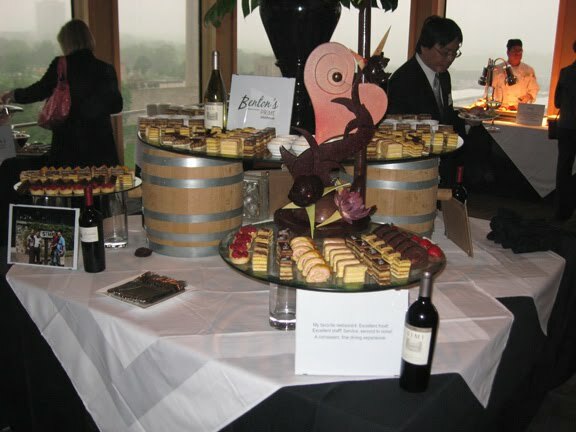 Thanks again to Benton’s Prime Steakhouse for inviting us to this event. For items that don’t have a price listed, as far as we can tell it’s not on the regular menu. 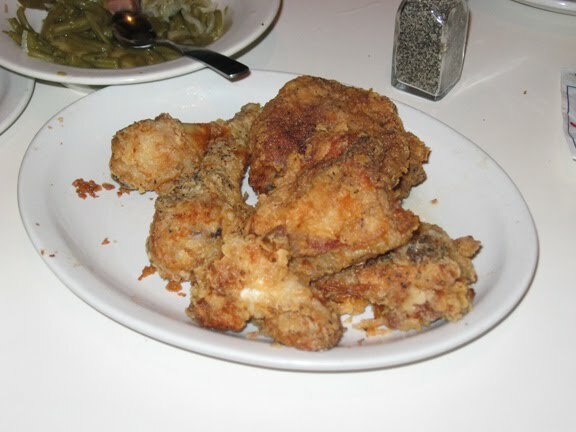 I love fried chicken. Two weeks before Guys’ Night we chose RC’s Restaurant & Lounge as our destination, and immediately an internal countdown started in my head. 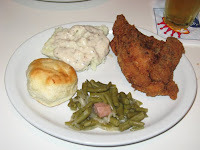 Unfortunately, what the evening had in store for me was the worst fried chicken I’ve ever had ever. Shaw, Dorsett, Adam and I all showed up at RC’s at about 7 p.m., and unanimously agreed we were ready to crush some fried chicken. 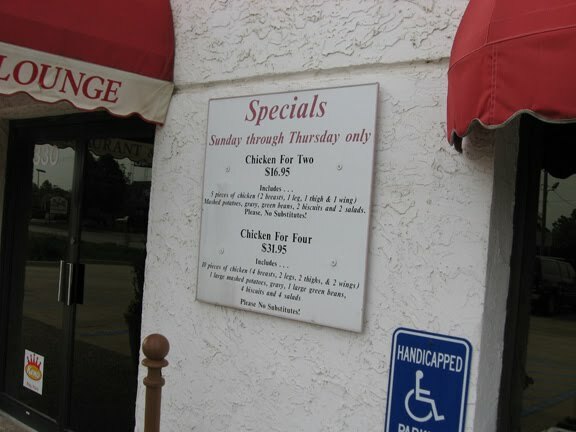 As we entered the massive red and white building, we noticed a sign outside advertising the Chicken for Four special ($31.95). Ten pieces of chicken and sides -- perfect. Checking out the menu, it didn’t take any of us much convincing that we should also get some wings ($7.95). 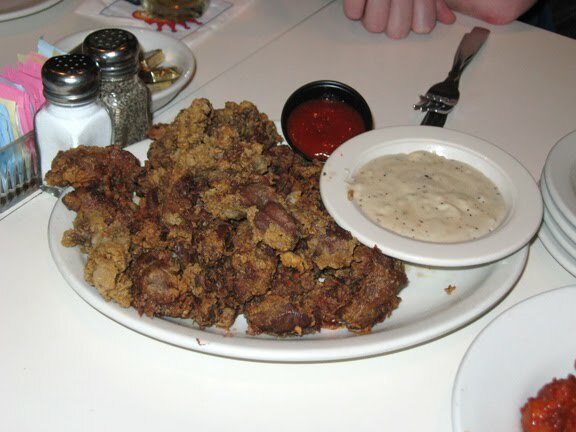 Then we added on a plate of livers and gizzards ($7.95), which did require a little bit of convincing from me and Adam to Shaw and Dorsett. 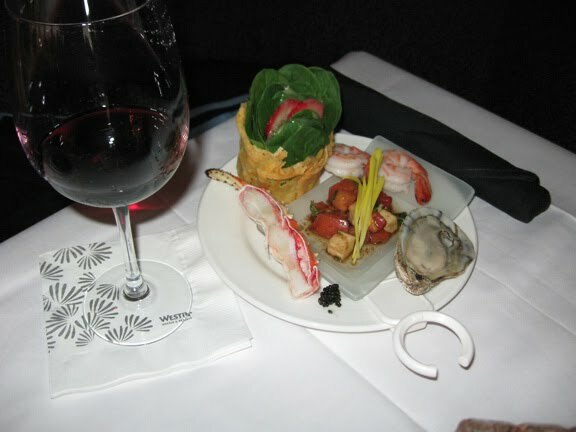 The appetizers arrived, and they were thoroughly underwhelming. The sauce on the wings had combined with the breading to create a spongy coating. As for the livers and gizzards, they were oddly flavorless. Coming with a standard cocktail sauce plus some gravy that didn’t have much of a taste beyond floury, the livers and gizzards didn’t even have that much use for dipping. Shortly thereafter we got our salads, closely followed by the rest of our food. With the Chicken for Four, you get four breasts, two legs, two thighs and two wings, as well as mashed potatoes and gravy, green beans and biscuits. Each of us started with a breast, which was instantly forgettable. They looked delicious, but like the livers and gizzards, didn’t taste like anything. 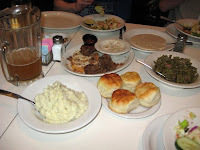 Our sides weren’t any better -- both the mashed potatoes and green beans were bland, and the biscuit was a rock. Even though the salad wasn’t particularly special, bafflingly it turned out to be the high point of my meal. Up until now, RC’s had just been one big disappointment -- win some, lose some, no big deal. However, we still had six pieces of chicken left. And while everybody else decided to pass, I figured I might as well give RC’s one more shot, and picked up a drumstick. That’s where the experience irreparably fell apart. Biting into the drumstick was what I imagine sinking my teeth into wet paper mache might be like -- sticky and chewy and wrong. I’m not sure what it tasted like, only that it didn’t taste like food. During the hour or so it took us to eat, the dining room had emptied out. We paid our bill, and unable to muster the enthusiasm to think of different places to go, headed upstairs to RC’s Back Door Bar & Grill, so named because the bar’s main entrance is on the rear of the building. “Land of Confusion” by Genesis was playing when we walked in the Back Door Bar, making it seem kind of like the ‘80s music was following us throughout the building, except this version was a remake by Disturbed. I choose to believe that no matter what song is playing in the main restaurant, a nu-metal cover of it is blasting upstairs. Tonight’s special was $1 PBRs, so at least we could have some cheap beers. After spotting a "Test Your Strength" punching machine, having learned a valuable lesson at our last Guys’ Night, we took the table farthest away from it despite the fact there weren't that many people at the Back Door Bar. Shaw pointed out a nearby patron eating a club sandwich, and we all concurred we would’ve rather had that than the fried chicken. Eventually we realized we were talking exclusively about how much we didn’t like this place, so we decided to cut our losses and call it a night. 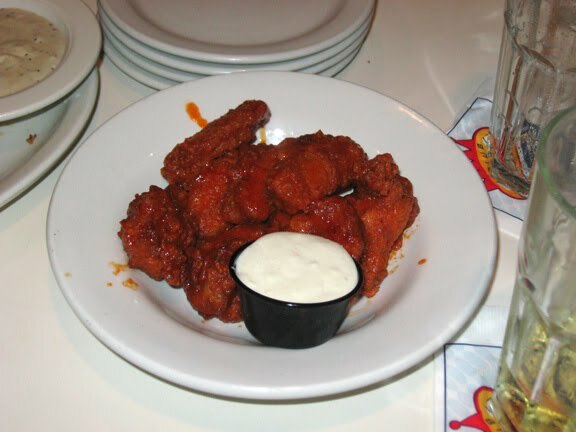 Look, here at Lunch Blog, we take no satisfaction out of giving a place the thumbs down. 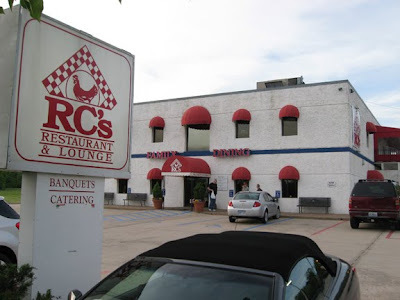 RC’s has been around since the early ‘70s and it looked like there were a lot of regulars in there, so it’s got to have something going for it. Hopefully our experience was just a fluke -- if you’ve been to RC’s, we’d love to hear what you thought of the place.